Tight shoulders? You’re not alone. Nearly everything we do—sitting at a desk, working on a computer, cooking a meal, picking up children, riding a bike, driving a car, etc.—closes off the front of our chests and creates varying degrees of tension in our shoulders and neck. Repeated over time, and your shoulders inevitably become tight. We also tend to hold a lot of tension in our shoulders, neck, and jaws thanks to our nervous system’s stress response (or hyperarousal). When we become anxious or stressed our body responds accordingly, kicking us into fight-or-flight, a.k.a. survival mode. Your heart rate speeds up, pupils dilate, and your muscles contract, particularly your jaw, and before too long your shoulders are hiked up to your ears without you even realizing it. The good news is that we can work with the body and breath to calm down and essentially reverse the stress response. One of the many reasons yoga is so great! Opening your chest and releasing deeply held tension in your shoulders not only feels better physically, it will also help you relax. Below are some of my favorite yoga poses for tight shoulders. 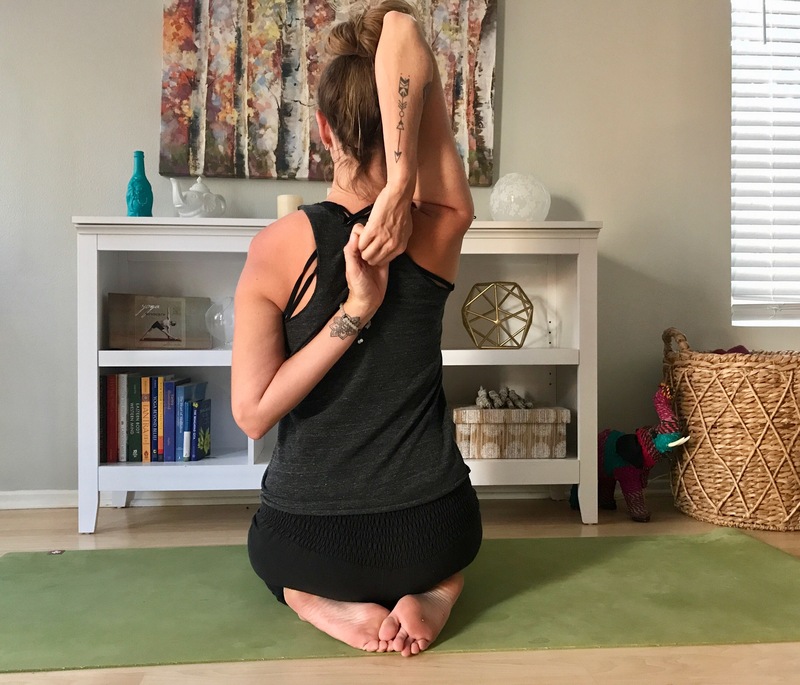 Prasarita Padottanasana, or a Wide-Legged Standing Forward Bend, with your fingers interlaced behind your back is probably the most common (and familiar) shoulder stretch done in yoga classes, mainly because it’s simple, easy to do, and effective. Begin standing with your feet about a leg’s length apart and parallel with all of your toes pointing straight forward. Reach your arms around and interlace your fingers behind you at your sacrum. Inhale and lengthen up through the sides of your torso; exhale, broaden your collarbones, and pull your upper outer arms back. Inhale and lift the sides of your chest up; exhale and, with bent knees, slowly hinge forward at your hips. 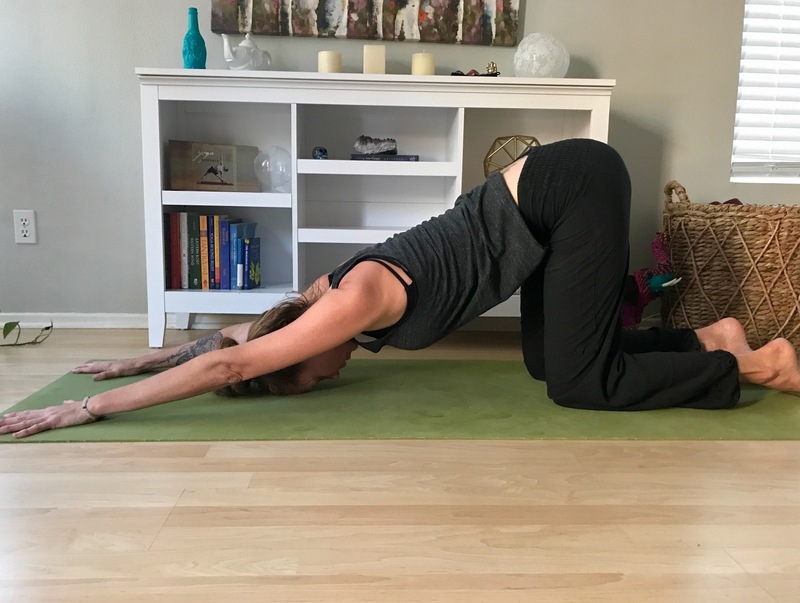 Once in a forward fold, continue to lift your upper outer arms and shoulder blades away from the floor, and release your sternum toward the floor. Lengthen the back of your neck and take five deep breaths. To release, unlace your fingers slowly and bring your hands to your hips. Bend your knees and, on an inhale, lift your elbows and shoulders away from the floor and rise back up to stand. The upper half of Garudhasana (Eagle Pose) can be a somewhat intense stretch through the trapezius, outer shoulders and upper arms, as well as between the shoulder blades through the upper back. There are a few different variations of the same stretch, so choose the appropriate one for your shoulders. Standing with your feet hip distance apart (or from a seated position), extend your arms straight out in front of you with your palms up shoulder height. Tightly cross your left elbow over your right. Now turn your palms out with your thumbs pointed at you. Use your left palm to press your forearms back to center with your fingers pointed up. Inhale and lift your elbows any amount; exhale and lengthen your hands away from your face. Take seven rounds of deep inhalations and exhalations. 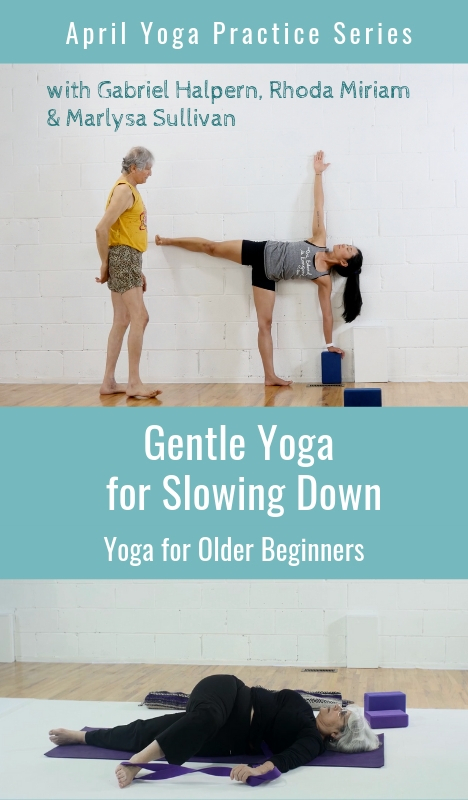 To release, slowly lower your elbows and unwind your arms, bringing them down to your sides before repeating on the second side crossing your right elbow on top. 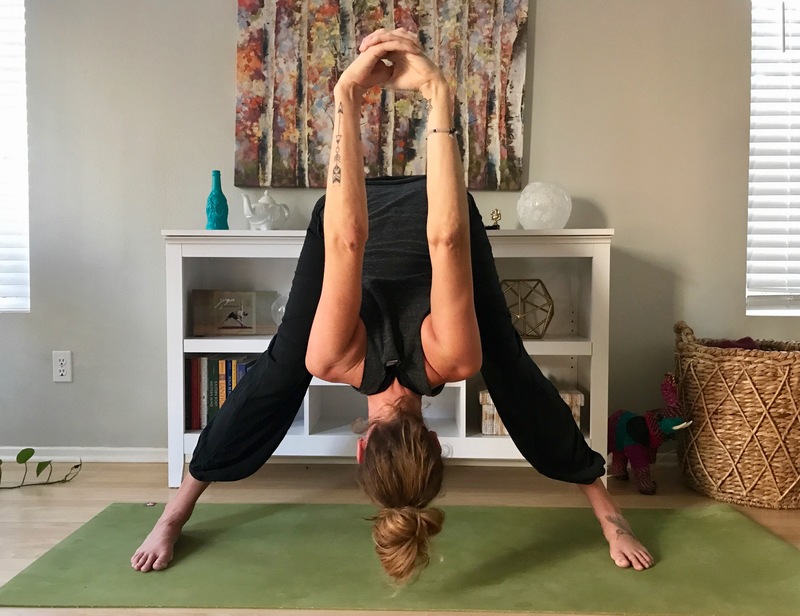 The upper half of Gomukhasana (Cow Face Pose), is a very deep stretch that requires external rotation of the top shoulder and internal rotation of the bottom, and often a strap between the hands to make the grasp. Either standing with your feet hip distance apart or sitting on a block with your spine lifted, inhale and reach your right are straight up. Slowly begin to rotate your right palm toward the back of the room, thumb pointing to the right. Bend your right elbow and bring your right palm to your upper back, pointing your right elbow skyward. Pause and bring your left hand to your right elbow, hugging the elbow closer to the side of your forehead. As you’re ready, reach your left arm out to the left and begin to turn your left palm to face the back of the room, thumb down. Slowly bend your left elbow, bringing the back of your left hand to you the middle of your back and up toward the back of your heart. If your fingers touch, hook them into each other, or hold on to a strap between your hands. To release, slowly lengthen your left hand down toward the floor and rotate the palm forward. Then reach your right arm back up before lowering it down by your side. Do a few large arm circles before switching sides. Ardha Pincha Mayurasana (Dolphin Pose) opens upper back while deeply stretching the shoulders and outer arms. I actually prefer it to Adho Mukha Svanasana (Downward Facing Dog); however more flexibility of the hamstrings is required, and it’s a bit gentler on the wrists. 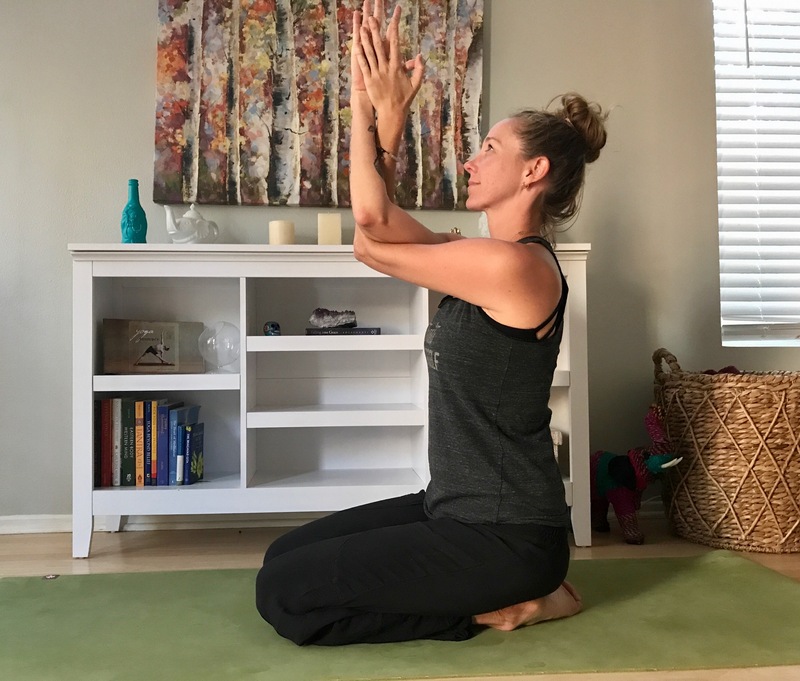 From Tabletop Pose on your hands and knees, lower your elbows to the floor directly underneath your outer shoulders and parallel your forearms, pointing your index fingers straight forward. From Tabletop Pose, place your forearms on the floor with your elbows directly underneath your shoulder heads. Clasp your hands together, interlacing your fingers. Tuck your outside pinkie finger inside the other so that the outer edges of your wrists and hands are flat and even. Press down through your outer wrists and forearms, and lift your shoulders away from the floor. Tuck your toes under and begin to lift your knees up, taking your hips up and back. Keeping your forearms parallel, spread your fingers, press down through your elbows and strongly lift your shoulders away from the floor. Hug your elbows toward one another and broaden your collarbones as you press your thighbones back. Lower your knees back down after a few breaths and press back into Balasana (Child’s Pose). 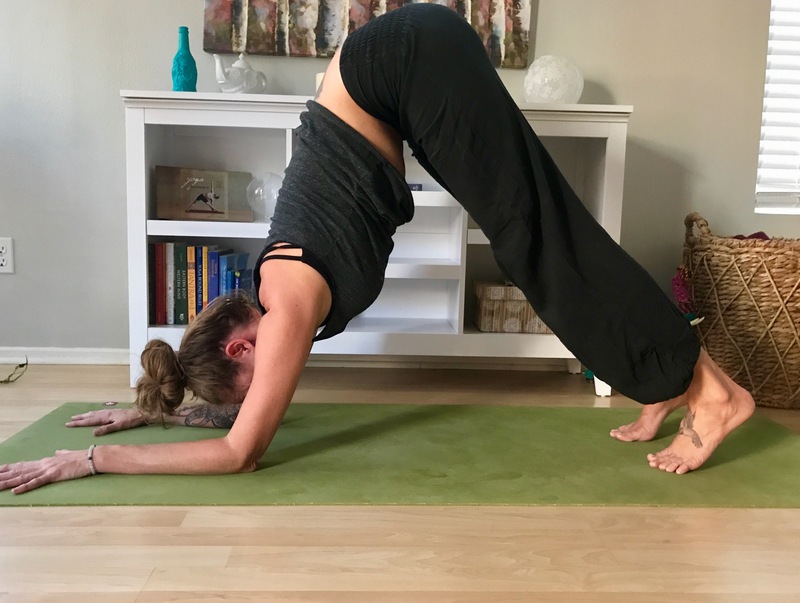 Utthita Shishosana (Extended Puppy Pose), is basically a non-(or very little) weight-bearing Downward-Facing Dog Pose, gently stretching the spine in both directions while opening the shoulders, chest, upper back, and underside of the arms. Come into Tabletop Pose on all fours with your knees underneath your hips and shoulders over wrists. Point your toes straight back, resting the tops of your feet on the mat, and parallel your shins. Slowly begin to walk your hands forward, keeping your arms straight, and lower your chest towards earth, releasing your forehead to the mat (if your forehead doesn’t easily rest on the floor, try placing a low block underneath it). Keep your hips high over your knees. Press into your palms and lift your forearms, elbows, and shoulders away from the floor. On an inhalation, reach your hips up and back lengthening your spine; exhale and gently draw your low ribs in to support your low back. If your neck feels comfortable, take five to seven rounds of breath. When you’re ready walk your hands back and return to Tabletop Pose. More from Meagan McCrary - Shoulder Anatomy 101: A Beginner's Guide to the Shoulder Girdle. Shoulder Care from YogaUOnline and Olga Kabel - 3 Essential Steps to Protecting Your Shoulders in Yoga. Study shoulder care with Julie Gudmestad: Creating Shoulder Strength and Stability - Focus on Serratus.